Quentin C. Aanenson, WWII fighter pilot and understated witness to the physical and psychic wounds of that war, earned national recognition fifteen years ago, when his self-written video documentary A Fighter Pilot’s Story aired on public television. Aanenson, who died on December 28, 2008 at the age of 87, was that fighter pilot of the title, surely one of the most reflective American warriors of the Second World War. Aanenson was born and raised in Luverne, Minnesota, but in recent decades was a life insurance executive and resident of Bethesda, Maryland. He set out in the early 1990s to make for his family a record of his combat experiences flying the P-47 Thunderbolt fighter-bomber in 1944-45, supporting Eisenhower’s GIs as they advanced from Normandy’s beaches all the way into the heart of Germany. He fought a very dangerous war, dive-bombing and strafing the German army from low altitude. Aanenson was over the D-Day invasion beaches in June 1944, and he directed air strikes as a forward air controller through the American crossing of the Rhine in March 1945. His frank observations of how the brutality of war affected his own life during and after combat offered today’s Americans some of the most revealing insights into what “the Greatest Generation” experienced in World War II. Aanenson’s video combined his own photographs with images and film garnered from the National Archives, woven together with his memories and excerpts from his letters home. He wrote to one particular girl: Jacqueline Greer, a secretary he had met at the airfield in Baton Rouge where he trained in the powerful Republic P-47. Jackie was his confidant, and his letters home to her, and her replies, formed the narrative backbone of the moving A Fighter Pilot’s Story. The love Aanenson expressed to her and the support Jackie lent him in those letters proved a welcome island of tenderness in the swirl of combat that surrounded him for nine months. 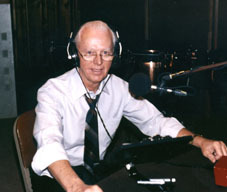 Word of Aanenson’s powerful story soon spread beyond his family and friends and led to a 1993 broadcast on Maryland public television. A Fighter Pilot’s Story went on to air nationally, adding to the historical tribute being paid to America’s WWII veterans to mark the 50th anniversary of the D-Day invasion. Aanenson’s introspection was rare among fighter pilots, men of few words, selected not for their self-awareness but for aggressiveness in the air. They typically let their record in combat do the talking. Quentin Aanenson was an exception. Co-author June English and I included one of his letters home to Jackie in our 1998 book for young people, chronicling the nation’s military history. His words, telling her what he was going through, how the deaths of close friends affected him, were direct even as they tried to spare her the horrors he saw every day from this Thunderbolt. Aanenson’s letter helped us bring home to today’s young Americans what it meant to be a citizen-soldier in World War II. Flying with the 391st Fighter Squadron of the 366th Fighter Group, Aanenson saw much of death and destruction as the Allies pushed the German army across France and penetrated Hitler’s Reich. Attacking rail yards in Rouen, France in July 1944, his Thunderbolt took a direct hit from a deadly German 88mm antiaircraft shell. The fuse failed to explode; he flew the battered plane back to base. On August 3, German flak over Vire again caught his plane, damaging his controls and setting his cockpit afire. Battle damage had jammed his canopy; he couldn’t bail out. Trapped, Aanenson determined not to burn alive in the cockpit: he dove his plane, “looking like a comet,” straight toward the ground. But the steep, high-speed plunge extinguished the fire, and the 23-year-old pilot somehow got the Thunderbolt lined up with his nearby runway. 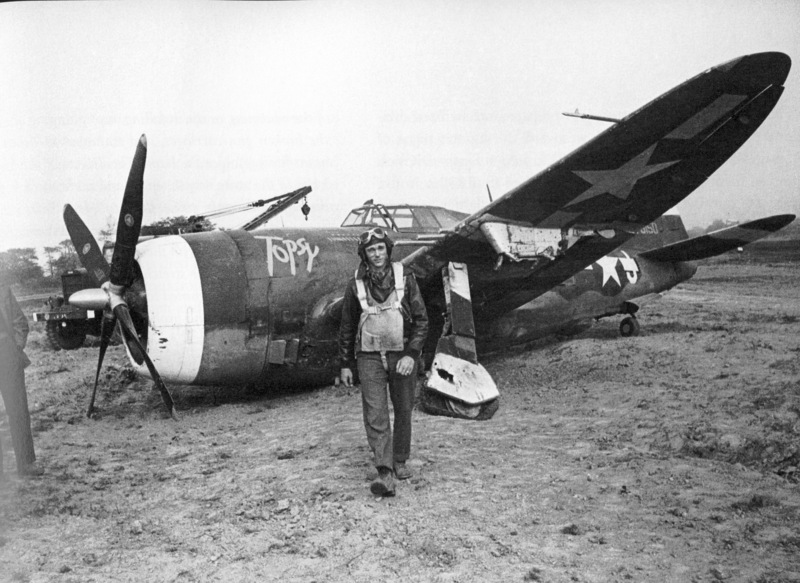 He put the barely controllable P-47 down at 170 mph, but a blown tire caused the damaged landing gear to collapse, spinning the big fighter around. The impact tore loose his shoulder harness and cracked his skull against the gunsight. Two ground crewmen pulled him from the smoking wreckage, unconscious but alive. Ninety minutes later, burns bandaged but still suffering from a concussion (which caused blinding headaches for years after), Aanenson managed to stand in front of his mangled fighter for a Picture Post photographer. The image captured a young man, wounded, weary–yet determined to do the job he was assigned until victory was won. How did he climb into a cockpit to face death again and again? “It changed from patriotism to fighting for my buddies and the guys on the front lines,” he told me in June 2006 in an interview for a new book about the Thunderbolt men. Assigned in the winter of 1945 to direct air strikes from an observer’s post on the front lines, Aanenson lived and fought with the GIs he had helped so often from the air. On Feb. 23, near Duren, Germany, an enemy shell exploded in his post in the great hall of a ruined castle, spraying him with bits of what had once been a soldier’s body. He calmly brushed off the gore and got back on the radio, vectoring more Thunderbolts onto the target. After surviving 75 combat missions, Aanenson rotated home in March 1945, and a month later married his sweetheart, Jackie. Their marriage, forged in the harrowing separation experienced by so many wartime couples, thrived for 63 years. Only rarely, now, in my dreams or nightmares, do I revert to those days of death and despair that took place so long ago. I see the faces of my buddies who were killed. I see them as they were ‑‑ while those of us who survived grow old ‑‑ they will be forever young. I will always remember them ‑‑ and I will always wonder how it was that I escaped their fate. Aanenson’s powerful postwar testimony reminds us of that sacrifice, freely offered up by so many to guarantee the liberty we enjoy today. With Quentin Aanenson’s fellow airmen, and grateful Americans everywhere, I mourn his passing, even as we remember his eloquence and courage. Thomas D. Jones, pilot and veteran shuttle astronaut, is the author (with Robert F. Dorr) of Hell Hawks! (Zenith, 2008) the true story of a band of Thunderbolt brothers who fought in the air alongside Quentin C. Aanenson. 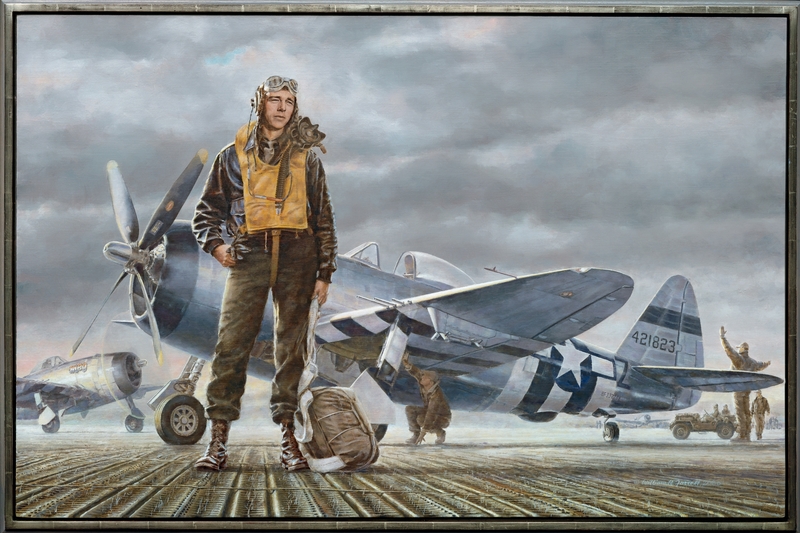 Quentin C. Aanenson in William Farrell's painting, "Thunderbolt Patriot." The original hangs in the National Air & Space Museum's offices on the National Mall. Mr. Aanenson, who died on December 28, 2008 in Bethesda, Maryland, is the subject of this painting by William Farrell. Here the 23-year-old native of Luverne, Minn. prepares to strap into his P-47 Thunderbolt for another strike against the German Wehrmacht. I learned yesterday, Sunday the 28th, of the death of my friend, Thunderbolt pilot Quent Aanenson. My heart goes out to his family, and especially to his beloved wife of 63 years, Jackie. I’ll post more about Quent in the next few days. Meantime, please visit his site, A Fighter Pilot’s Story. If you haven’t seen his video of the same name, you’ve missed one of the most moving memoirs of WWII. As we look toward the heavens and the Star of Bethlehem during this Christmas season, relax with a conversation about Planetology: Unlocking the Secrets of the Solar System. Both Ellen Stofan and I appeared on The Space Show, hosted by David Livingston, PhD. David hosted us for nearly 90 minutes of discussion and audience questions about our spectacular new book from National Geographic. Even as Endeavour returned to Kennedy Space Center last week, NASA announced plans to move the orbiter fleet to museums for public display following retirement in 2010. All three orbiters–the most sophisticated flying machines ever built–deserve a dedicated display “hangar” and easy public access. My guess is that one (probably Atlantis) will wind up at the Smithsonian’s Udvar Hazy Center of the National Air & Space Museum, near Dulles Airport, VA. Discovery, because of its record of multiple Department of Defense missions, might head for the National Museum of the U.S. Air Force in Dayton, Ohio. Endeavour would be ideally suited for a West Coast location, given the huge population base in California and the excellent aviation and space museums in San Diego and Seattle. Enterprise might be a candidate for either Houston’s Johnson Space Center or Kennedy Space Center at Cape Canaveral, Florida. One thing is certain: people in one location or another are going to be unhappy that a shuttle does NOT come to their town. The competition is already underway, with a British group stating its intentions to bring an orbiter to London in 2010. Civic officials in Houston and Florida are also laying the groundwork for display space and the fundraising of the roughly $42 million NASA says it will cost to prepare and transport anorbiter to a given destination. I had long hoped to visit Columbia–my ship–at its future home at the National Air & Space Museum. That dream was dashed with the loss of the first space shuttle in 2003. Wherever my other two ships wind up — I will be visiting (I think I still have a key)! 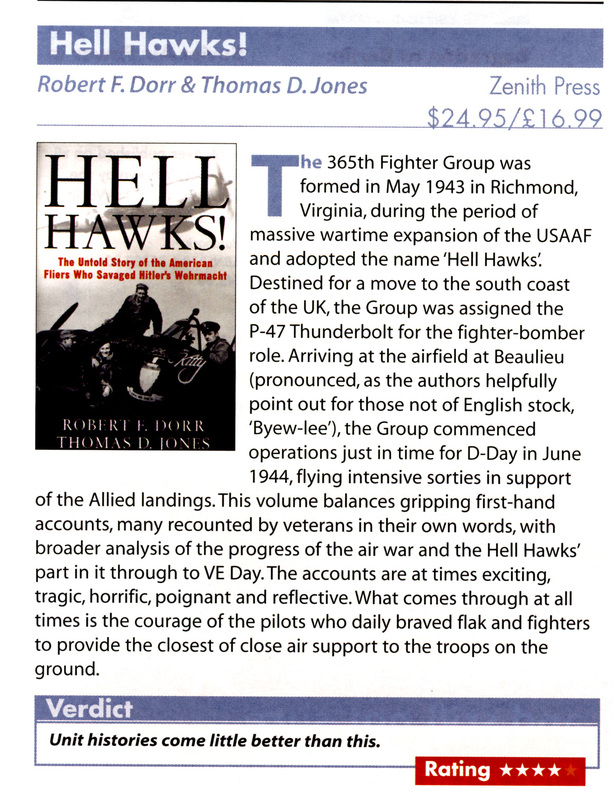 I’m grateful for Mr. Calvert’s praise, and would add that Hell Hawks! is not just a unit history. It is a wider human interest story of young Americans at war, caught up in the most intense combat the world had ever seen. This aerial band of brothers included not just pilots, but the ground crewmen without whose dedication the Thunderbolts of the Hell Hawks would never have gotten airborne. A Merry Christmas and Happy Holiday to all! Thanks to David Livingston for setting up this opportunity. His show does a great job of treating space topics with depth and insight. A sample of the kind of fascinating images from across the solar system found in Planetology. I’m looking forward to discussing with Houstonians my new book, Planetology, at the University of Houston, Clear Lake campus on Friday, Jan. 9 at 7 pm. An event announcement is here. 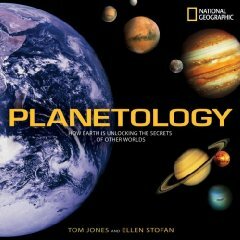 Planetology (Jones and Stofan, National Geographic Books, 2008) appeared in stores on Nov. 18, 2008. My talk will focus on the how the latest imagery of our family of planets, and the information it contains about the forces that shape the planets, compels us to explore the solar system and establish ourselves on other worlds. The motivation? Knowledge, of course, but more important — survival. I’ll be signing copies of Planetology (written with my friend and colleague Ellen Stofan) after the talk. 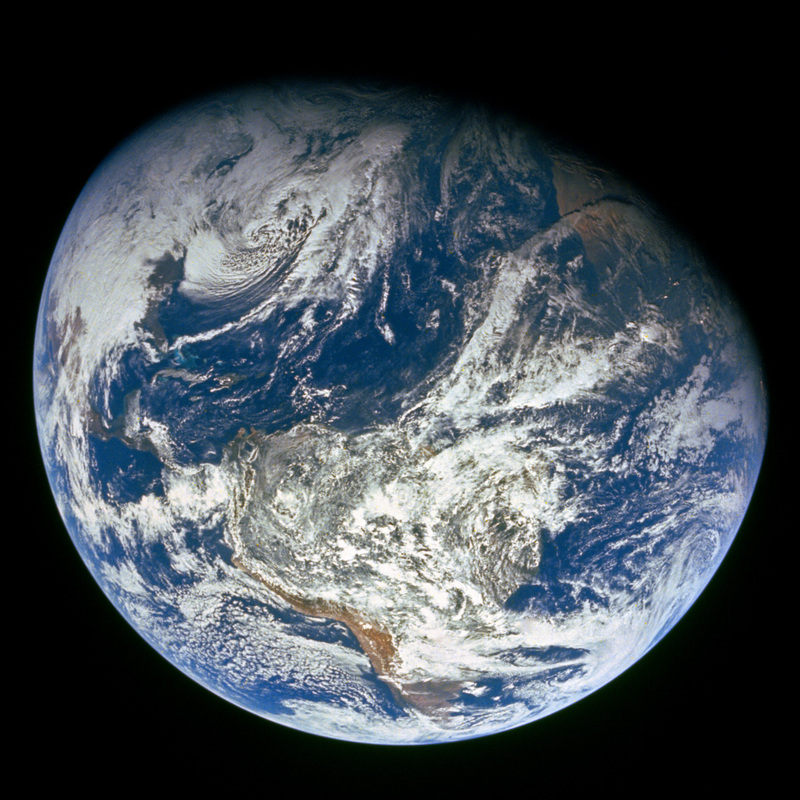 Join me for a spectacular visual tour of the worlds that have taught us so much about our own Earth. The Buzzard Coulee Sasketchewan fireball produced a plentiful meteorite fall, and observers of this Colorado event are searching for fragments from this latest asteroid impact. News reports commented on how both the Sasketchewan and Colorado fireballs (and meteorite falls) went unpredicted by “NASA”, as if the space agency were on the lookout. Although NASA is completing its search for NEOs larger than 1 km in diameter, detection of objects this small (roughly a meter or two in diameter) is completely a matter of luck. 2008 TC3 was picked up just a day from impact, because it happened to be in the field of view of one of the NASA-funded NEO search telescopes. But there is no systematic search for asteroid fragments this small (which detonate with the energy of several hundred tons of TNT). The National Research Council is commencing this month a study of how NASA might extend the search for NEOs to smaller diameters (about 140 meters across, in the latest Congressional direction) and analyze options for deflecting such hazardous bodies. Rusty Schweickart, my colleague at the Association of Space Explorers NEO Committee, has just completed briefing UN ambassadors in Vienna, and will testify before the NRC study team later this week. Our ASE effort is aimed at the international adoption of a decision-making program to deal with future, and potentially destructive, asteroid threats. “Astronomy always provides some of science’s most stunning images, and Planetology delivers the goods. More than a rundown of the diminished solar system, with Pluto and its brothers banished to “dwarf” status, the book delves into the forces, asteroid impacts, volcanism and erosion that sculpted Martian dunes, Mercury’s craters and Titan’s lakes. The book finishes with some speculation on the “Planetary Zoo” worlds orbiting nearby stars. “The holy grail of exoplanet searches is an Earth-like planet in the habitable zone around its star,” the authors write. Check out Planetology at a nearby bookstore, and let me hear what you think.